NB See also the team's own website page for etiquette and dress (in the lessons menu). This page concentrates on competitive dress. 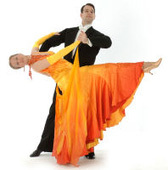 For more general information and what to wear for classes and general dancing, see here. Beginners competitions are always in non-competitive dress. At university competitions, this must comply with the IVDA guidelines (section 3.18 of the IVDC constitution). It does not permit items designed for competitive wear, but it does allow practice wear (included latin trousers) sold by dance retailers. Men: Plain dark trousers, plain shirts, ties or bow ties, waistcoats. Ladies: Plain skirt or trousers, tops without excessive adornment, dress (not a ballgown). For men, fairly loose-fitting trousers are recommended so that you can stride out properly. The length is also important; they should not be so long that you tread on them, but not so short that they show your socks when you point your feet. Remember to wear black socks! If you have particularly long arms, find a shirt to match so that it is not too tight when you raise your arms into hold. A nice shirt with cufflinks is much better than one with ordinary buttons at the cuffs. For ladies, make sure that your skirt is full enough for you to stride out properly. Avoid wearing black all over; if you have a black skirt, wear a brightly-coloured top (or vice versa), and accessorise as much as possible. Men: Plain dark trousers or latin trousers, plain or ruffled shirt or T-shirt, plain latin top (no transparent material), ties or bow ties, waistcoats. Ladies: Plain skirt or trousers, top or dress without excessive adornment. Plain is defined as meaning unpatterned or having a small single or repeating pattern. For men, again check the length of your trousers. If you're not wearing Latin trousers, make sure that your trousers are not too tight so that you can do Latin lines and lunges. Something with a slightly stretchy material is best. For ladies, if you are wearing a short skirt, try spinning in front of the mirror to make sure that it is decent. Make sure that you are wearing decent underwear (black, or matching your skirt) in case of a mishap! Again, avoid wearing all black and accessorise as much as possible. Dancing shoes are not a necessity for beginners' competitions, but they do make dancing a lot easier. Look at the links page for the major shoe suppliers. If you don't have proper dance shoes, something with a slight, slim heel is ideal for women, and men are advised not to wear trainers. Please note that heel protectors on ladies' dancing shoes are now compulsory at most of our venues, including Parkside (hall and gym) and St Mary's. You will not be allowed to take part in a class or private lesson if you are wearing shoes without heel protectors. Heel protectors are available from all dance shoe suppliers and can be ordered online. More information about dance shoes can be found here. Wear as much jewellery as possible. There are no limits on accessories, and diamante chokers, sparkly hair clips, belts, large earrings and bracelets are all eye-catching. The lights on the floor can be very unforgiving so fake tan is recommended, along with a dark foundation. Dark eyes with white under the brows and a bright lipstick are the norm. Use eyeliner and lipliner to define your features. Fake eyelashes can also add to the effect. Hair should be neat and slicked back. Most girls prefer to secure their hair in a bun and accessorise with a flower/diamantes. The more adventurous can darken their hair for a latin look. If you have long, tidy nails, you can either paint them in a colour that complements your costume or do a French manicure to finish off the effect nicely. If you have short or bitten nails, use fake ones. Also gel back your hair and wear fake tan or foundation so you don't look washed out on the floor.